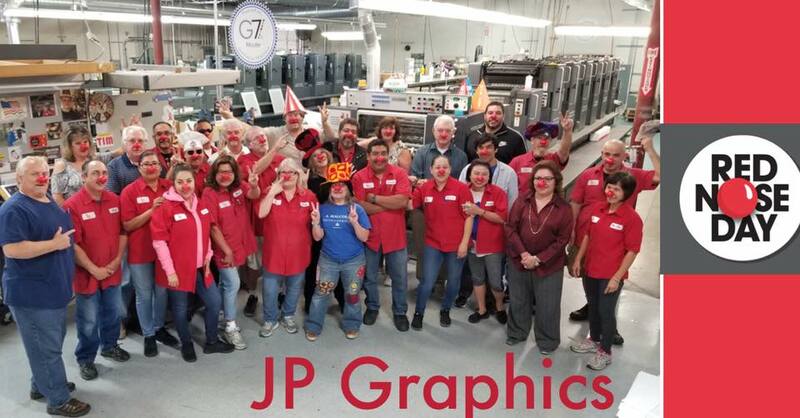 It’s Red Nose Day at JP Graphics! At JP Graphics, we’re on a mission to end child poverty, and support programs that keep children safe, healthy, and educated. We’re proud to contribute to the Red Nose Day movement. What is Red Nose Day? Red Nose Day is a fundraising campaign run by the non-profit organization Comic Relief Inc., a registered U.S. 501(c)(3) public charity. Globally, Red Nose Day has raised over $1 billion since its launch in 1988. Red Nose Day launched in the US in 2015, dedicated to ending child poverty, both in the US and in some of the poorest communities in the world. The money raised by Red Nose Day in the US has benefited programs for children and young people in all 50 states and in 34 countries internationally. The money raised by Red Nose Day benefits children in some of the neediest communities in the US and some of the poorest communities in the world. Partner charities include Boys & Girls Clubs of America; charity: water; Children’s Health Fund; Covenant House; Feeding America; Gavi, the Vaccine Alliance; UnidosUS; Save the Children and The Global Fund. https://jp-graphics.com/wp-content/uploads/2018/05/Red-Nose-Day_JP-Graphics.jpg 502 960 mrr https://jp-graphics.com/wp-content/uploads/2013/06/JP-Graphics-Logo.png mrr2018-05-29 23:43:592018-05-29 23:43:59It's Red Nose Day at JP Graphics!